Bimberi Peak, or Mt Bimberi, is the highest peak in the ACT at 1912 m.a.s.l. It lies towards the south of the Brindabella Range, straddling the border between the ACT and NSW. Funnily enough, I'd never actually climbed Bimberi - perhaps because its remoter and harder to get to than many of the other Brindabella peaks such as Mt Franklin, Mt Gingera etc. So, when a friend of mine suggested we hike it, I was keen. There were 6 of us in the end. We decided to do the walk from Orroral valley, leaving cars at the abandoned Orroral tracking station and hiking ~14 km to Cotter Flat on the first day. The second day we left the tents and other non-essential items at Cotter Flat, and climbed up to Bimberi Peak and back down and camped again that night at Cotter Flat, a round trip of about 18 km. The final day we hiked back the same way we came. I highly recommend this walk! 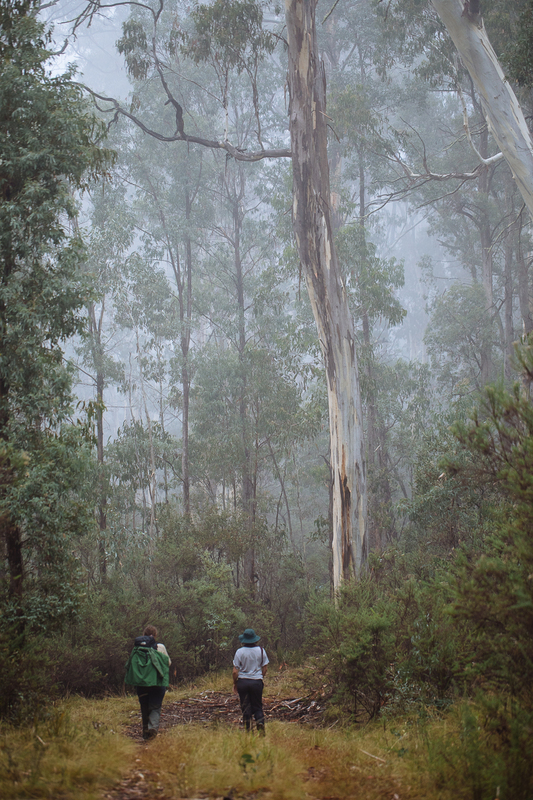 From the tracking station, the trail winds into the forest and it feels like you're heading straight into remote bush. 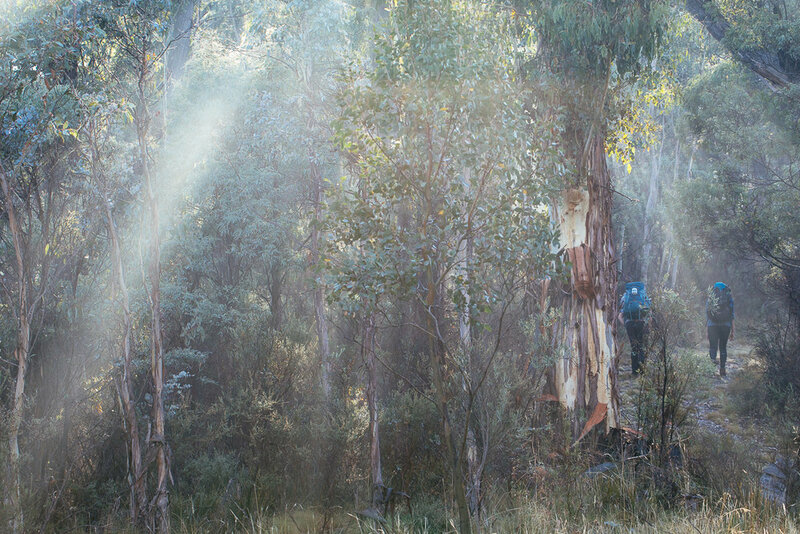 The forest is a mix of peppermint, mountain gum and candlebark with Acacia, Cassinia and some native cherry, with shaggy-pea bushes and some low geebung. In some sections (the best sections as far as I'm concerned!) there are some really nice stands of Banksia marginata, occasionally in such density as to almost deserve being called a 'banksia forest'. There was a particularly nice stand where the Australian Alps walking trial turns off from the fire trail on the ascent. This would be a great place for honeyeaters I reckon, and I did hear some Crescent Honeyeaters and Eastern Spinebills calling away. (I only took my 100mm macro lens with me on this walk, so that's why there are no lovely wide-angle images). A clump of Banksia marginata candles growing together from the stem. We left the cars around 10am and wandered down to Cotter Flat a little after 3:30pm, having walked a leisurely pace and stopped for lunch. 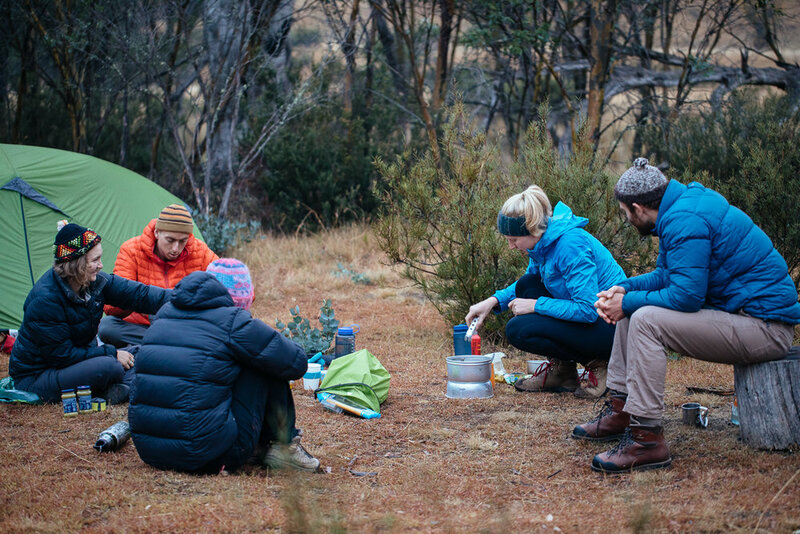 We set up camp at Cotter Flat not far from the Cotter River which, thankfully, provides good drinking water even in a dry year like this one. The middle day we set off at 7:30am to hike the peak. The track heads south before curving back north and taking you up to Murrays Flat from where the final ascent follows a semi-marked track along the border up toward the peak. The section from Cotter Flat to Murrays Flat is still in places, but all along fire trail. We didn't have much time at the top of Mt Bimberi, because as soon as we got out our lunches some threatening clouds started rolling in and soon it was thundering and raining. Needless to say we didn't stay long. The view from Mt Bimberi. The view from Mt Bimberi looking east or north-east. A Pied Currawong summits Mt Bimberi. I spent a lot of time on this walk marvelling at the beautiful bark colours of my new favourite eucalypt tree, Eucalyptus stellulata, or Black Sallee. The bark colours vary between an odd greenish blackish yellowish and a more reddish brownish kind of colour. Up close, they have the most beautiful flowers too. They are often multi-stemmed and rarely seem to grow particularly tall. Eucalyptis stellulata bark. This one is a more orange red. Hiking out of Cotter Flat past the lone poplar tree. Hiking through the fog and forest.